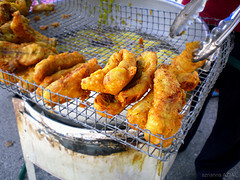 Pisang goreng (Fried Banana Fritters) recipe. Cut banannas into halves lengthwise. Add slake lime to batter for batter which needs slake lime. Mix well. Dip bananas one piece at a time into batter. Slide coated bananas into heated oil. Deep fry till golden brown over low fire. 150g. / 5 oz. sweet potatoes of the yellow variety - sliced. 150g. / 5 oz. yam / taro - slice.